Behind the long lines of first-year students waiting to board buses for the annual O-Week late-night trip to Target Thursday night, the loud beats of local musicians boomed. Students gathered in crowds to jam along with some of Pittsburgh’s rising rappers and rock bands — all on the William Pitt Union lawn. WPTS Radio, Pitt’s student-run radio station, held its annual Radio Showcase Thursday night. The evening of pizza, candy, raffles and of course, music, featured three local artists — rapper Treble NLS, punk band Sleeping Witch and Saturn and rock band The Zells. Divyanka Bhatia, a junior information science major and the production manager of WPTS, introduced the acts and played a large role in managing the station’s DJ appearances on campus during O-Week. She also worked in conjunction with WPTS music director Calder Buisch to set up the Live Music Showcase. Buisch — a senior politics and philosophy major — described the official processes of holding a music festival on campus. “We came up with what we wanted to do a month ago, we planned out the bands we wanted to have. So after that there was an interim period of getting contracts in from the University,” Buisch said. In order to provide their audience with some fresh sounds, the WPTS staff chose bands that were gaining popularity in the local music scene but were not previously affiliated with WPTS. 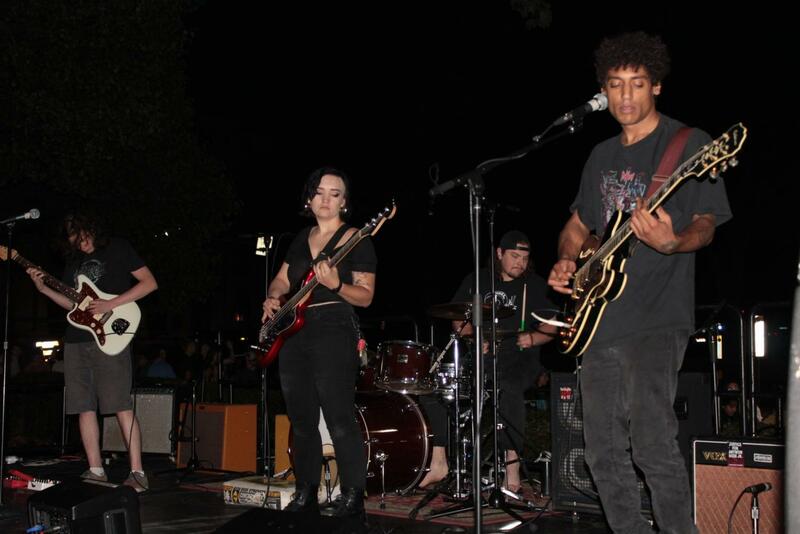 Following the solo rap performance of Treble NLS, one of Buisch’s personal favorite local acts — Sleeping Witch and Saturn — took the stage in front of a growing crowd in the WPU Lawn. The punk band played a mixture of original tunes and a cover of Joy Division’s hit “Shadowplay,” causing cheers and moshing to break out from the crowd of excited spectators. “This sort of happened on accident, but everyone that we booked had projects that they released within a month of the showcase, which added to the excitement,” Buisch said. Treble NLS released a project at midnight just after the showcase ended, while Sleeping Witch and Saturn dropped their new EP two weeks prior. The last act of the evening — rock band The Zells — will release a new album on Sept. 7. The two radio workers were excited to share the details on local artists, the radio station’s main focus for this year’s musical vision at WPTS. “Sleeping Witch and Saturn has been one of our top charting artists, Treble NLS will be in our lineup soon and as soon as The Zells release their album we’ll get that one in as well,” he said. Despite enjoying some of their favorite local musicians, the best part of the showcase for these two was not the music. One unexpected responsibility for Bhatia and Buisch was monitoring the mosh pits that formed in the audience of at least 100 students. “The crowd was really getting into it, I had to make sure people weren’t getting plowed over,” Buisch said. Guests to the showcase were clearly having fun. Bethany Brubeck, a sophomore engineering student, took in the event while snapping photos. “I thought it was awesome. I really love seeing bands that I have never heard of much more than if I would have heard them on Spotify or iTunes or something like that,” she said. Brubeck said she was set on attending the event as soon as she heard about it from friends at WPTS. The decision proved to be a good one for her.